Dozer Blade 2500 - Reach It! - Move It! - Crush It! 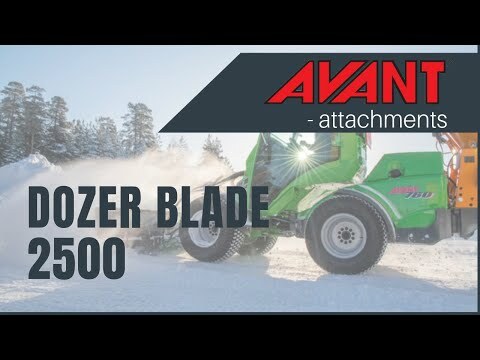 Equipped with hydraulic blade turning, Avant dozer blade is the ideal tool for snow removal, earthmoving and similar jobs where the materials must be dozed away quickly. The blade is equipped with spring release mechanism which protects the blade and driver in case it hits an obstacle. Dozer blade 2500 is ideally designed for clearing snow from large areas, such as large industrial estates, parking lots etc. Dozer blade 2500 is equipped with two bolt-on extensions, 250 mm each which can be mounted as collecting or straight edge. Equipped with a turnable blade with straight and ice cutting edge. Skid shoes are standard equipment as well – they guarantee smooth dozing also on uneven surfaces.